module and the KLA181 offers the same highly efficient power amp module in a 1,000 watt configuration. This efficient design enables up to five KLA models (any combination of KLA12 and KLA181) to be driven off of a single 15 amp, 120 volt electrical circuit. KLA loudspeakers incorporate QSC's DEEP� DSP algorithm - providing extended bass response by actively managing potentially damaging low-frequency transients - and GuardRail� circuitry protection which prevents the amplifier module from unnatural and destructive clipping. In an installed application, multiple KLA Series loudspeakers can be "daisy-chained" for total gain control from a single remote pot wired to the on-board Phoenix-style connector. Additional power module characteristics on KLA include a balanced, line-level XLR input in parallel with an XLR "Thru" connector, PowerCon� In and Thru connectors, Attenuation Control and LED indicators for Signal, Limit, Power and Standby status. KLA's unique self-contained SOLO� (Single-Operator Logistics) Rigging System enables users to quickly assemble (and disassemble) the line array in a fraction of the time without the need for special tools or external hardware. 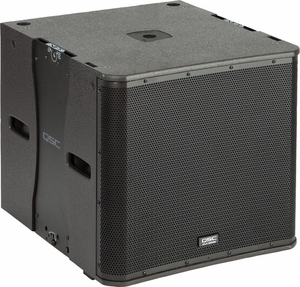 KLA181 Subwoofer In addition to DEEP� DSP algorithm, GuardRail�, Auto Standby, balanced line-level XLR input with an XLR "Thru" connector, Attenuation Control and LED indicators, the KLA181 subwoofer also includes a polarity switch for low frequency directivity control. KLA Series Two KLA12 Loudspeakers over the KLA181 Subwoofer Rigging & Deployment For maximum deployment flexibility, KLA loudspeakers can be either ground deployed or flown. As a ground stack, up to two KLA12 enclosures can be mounted over the KLA181 or the KW181 subwoofer via a threaded pole socket, or without a sub using an appropriately rated loudspeaker stand. KLA12 enclosures also feature the Tilt-Direct� 35mm pole socket allowing the loudspeaker to be aimed downward 9� for the best audience coverage. Arrays of up to 480 lbs (218 kg) (with a maximum five KLA12 and two KLA181 enclosures) can be flown via the included M10 fittings or the optional KLA AF12 array frame.